Over this Fourth of July weekend in Chicago, 84 people were shot and 16 killed. Over 1,000 people have been shot in the city since the beginning of the year, and almost all of them were black and Latino men under the age of 35. Shedding light on these numbers is important, but numbers on their own are not enough. A shallow focus on statistics and short-term solutions consistently dominates media coverage of violence in Chicago. This insubstantial, fleeting reportage ignores the deeper societal inequalities that continue to spur violence in the city's most marginalized black neighborhoods. The Chicago neighborhoods that have the highest violent crime rates are the same that have the greatest concentrations of poverty, incarceration, unemployment and failing schools. And while violent crime has fallen in Chicago (as in all major American cities) since the 1990s, Harvard sociologist Robert Sampson found that the same neighborhoods have remained the most violent. To address violence in our city, we cannot ignore the reality that race and racism are factors in Chicago's violence. 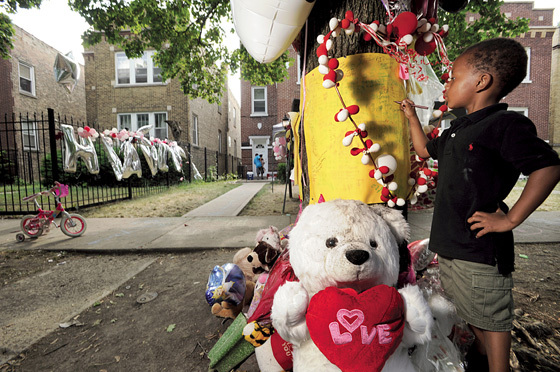 From 2000-2010, the murder rate in West Garfield Park was 64 per 100,000. Meanwhile, in nearby Jefferson Park the murder rate was 3.1 per 100,000. This is a difference of over 20 times. It is no coincidence that Jefferson Park is a working/middle class neighborhood on the Northwest Side, and West Garfield Park is an impoverished, 97 percent black neighborhood on the West Side. West Garfield Park has an unemployment rate of over 25 percent, a household poverty level of 40.3 percent, and 26.2 percent of its residents have not graduated from high school. According to the Chicago Tribune, it is currently tied as the second most violent neighborhood in the city. The evidence is right before our eyes. And it is not hard to deduce that over a century of systematic denial of rights and opportunities for black Chicagoans would send a message to young men that their lives are not worth as much as those in neighborhoods such as Lincoln Park or Lakeview. The facts demonstrate that inequality along racial lines is not a thing of the past. And it will not go away until concerted efforts are taken to promote racial equality. The facts also reveal that this 4th of July, which seemed shockingly violent, was actually not that different from the same weekend last year--when 70 people were shot and 13 killed. Unfortunately, it seems that the Emanuel administration and the Chicago Police Department would rather the media continue its shallow, fleeting coverage of Chicago's violence. That way, the continuity in the city's violence is less apparent and they face less pressure to address its root causes. The Emanuel administration claims that violent crime in Chicago is in an arc of constant decline, but this does not make the present conditions acceptable. Meanwhile, it is hard to say whether the official statistics can be trusted, since the CPD was recently caught cooking the books on murder and other violent crime statistics. And a recent audit [PDF] by the inspector general found that in incidents such as the 4th of July weekend, when many people are killed, the CPD might officially count several shootings as one incident to lower recorded statistics. So, as Slate writer Josh Voorhees put it, "recent history suggests that there's a realistic chance that by this time next year, the dead and injured from this past July Fourth won't be fully counted in Chicago's official crime statistics." Some have suggested that the solution to the violence in Chicago's black and Latino neighborhoods is to send in the National Guard. Yet the powers-that-be in Chicago have been attempting to solve the city's violence through increased policing for years now, and more of the same is clearly not what is needed. For example, Roland Martin argued in the Daily Beast that, "There is no reason the National Guard can't drop a dragnet over the hot spots in Chicago. They can erect barricades and check points, inspect cars, confiscate guns, run warrant checks and shut down the cartels in the city. In effect, Chicago needs a troop surge like what we saw in Iraq and Afghanistan. If we wanted to make the lives of residents there safer, why not do the same for Americans?" This line of thinking stems from the misguided notion that increased violence can work to make communities safer (and on a related note, if sending troops into Iraq decreased violence, how does one explain the violence currently engulfing Iraq? ISIS's takeover is one example of how sending in troops, or attempting to solve violence with more violence, in the end only breeds more instability, lack of trust in "authorities," and continues a cycle of violence). Instead of ramping up militarization, the city government, NGOs and city institutions should take purposeful steps to address the poverty and lack of opportunities in the city's poorest and most isolated neighborhoods. One tiny example of the city's lack of investment in, and the coinciding disregard for poor black lives, is the lack of a level 1 trauma center in Chicago's entire South Side. The University of Chicago runs a pediatric trauma unit, but there is nothing available for adults, leaving the only option for those facing severe trauma to hike to hospitals such as Northwestern Memorial near the Loop. A study by Northwestern Memorial found that longer travel times to a level 1 trauma center increase the likelihood of death from violent injuries such as gunshots. It is realities like these, that there is no trauma center for the city's entire South Side -- the most violent part of Chicago -- that dehumanize residents of the neighborhoods impacted. The response to violence on the South and West sides should not be the band-aid of sending in more armed officers to police and intimidate young men of color. Rather, it should be a focus on solutions that build up communities and show the residents of communities such as West Garfield Park that their lives are worth the same as young men in the Gold Coast. Opening a trauma center would be one small step in this process. As a resident of West Rogers Park on the city's far North Side, I know how far away neighborhoods like West Garfield Park and Englewood can feel. To many Chicagoans, at times it does not feel like this violence is occurring in the same place. But this is one city, and the violence could potentially hit home for all of us -- last week an innocent man was shot and killed waiting for the Devon bus not too far from my home. The killers were aiming for a rival gang member. My boyfriend was on the bus and heard the gunshots, and it could just as easily have been him waiting for the bus instead. Too often, we do not see Chicago as one community in which all residents have a vested interest in the well being of the city as a whole. But I hope we can come to recognize that all lives in Chicago are equally valuable, and in turn should be equally invested in. What if all of Chicago's neighborhoods were like Lincoln Park, with an unemployment rate of 4.7 percent, only 4 percent of residents without a high school diploma, and a per capita income of $73,130? Would we still have this violence problem then? Until purposeful steps are taken to equalize factors such as these, I do not see violence abating. From 1970-1980 alone, Chicago lost over 250,000 manufacturing jobs. At the beginning of that decade over 70% of African American men were employed in manufacturing. By the end of it, less that 30% were employed in factories. With this economic disaster came the predictable rise in alcoholism, drug addiction, and violent crime. And, because we did not meet this disaster with job training, increased education funding, and a comprehensive social safety net, what came was the development of the black market drug trade. A program of steering young jobless men away from illegitimate work by creating legitimate economic opportunity that provided family-sustaining jobs was not implemented. Instead, we saw the declaration of The War on Drugs. Due to this, millions have been incarcerated and labelled felons, a label that often bans people from trades and professions, public housing, food stamps, and student loans. The fix to Chicago’s violence is not an easy one and maybe that’s why self-serving politicians like Emanuel refuse to attempt what’s needed. What’s needed are schools with very small class sizes that offer not only core subjects, but arts, foreign language, computer classes, sports, and counseling. What’s needed are schools that offer meals, clothes, and free healthcare to all students. What’s needed is free daycare for parents so that they can pursue work knowing that their children are being cared for. What’s needed is free adult education that trains adults for family-sustaining jobs. What’s needed is a raise in the minimum wage to $15 per hour. What’s needed is the end of the disaster called The War on Drugs and a focus on violent crimes that terrorize poor and working class neighborhoods. But, again, as long as Chicago is led by the likes of corporate backed politicians like Emanuel and affluent Chicagoans can go about their day-to-day lives without actually seeing the violence that traumatizes poor children on Chicago’s West and South Sides, little will be done. For any real change to occur, the people must reject the Democratic Party and, as was done in Seattle, start electing people who truly represent workers and poor people. It has nothing to do with stable two parent families as role models. Just racial inequality. It has nothing to do with the decisions they make and their behavioral choices, Just us darn white people holding out on them. And especially, it has nothing to do with those so-called leaders who constantly tell them they won't get anywhere, so there is no point in trying. Marijuana possession is decriminalized in Chicago, and Mayor Emanuel is the main proponent of raising the minimum wage in Chicago to $13. What else was it that you wanted from an insolvent city with massive pension obligations? It's funny to me how people act like creating jobs and lifting people out of poverty is just as easy as wanting to. This article talks about equalizing the wealth of neighborhoods in Chicago, but doesn't talk at all about how to do it. Give me some purposeful steps about how a municipal government is going to redistribute the wealth among it's citizens when the rich can move across the border into Skokie any time they want and I'll be impressed. Everybody knows what the problem is, but how you solve it, that's the real issue. 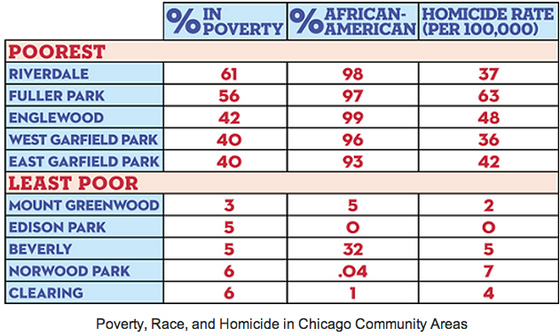 It is hard to accept that that root cause of all the violence on Chicago's South and West Sides is racial inequality. As someone pointed out, most of the young men who are shooting at each other are not exactly from a set of employable stats, as many of them are dropouts with criminal records. But it's not their inequality that you are seeing, it's more the inequality of their parents and grandparents that is showing fruit in this generation. One of the things that helps a community to stabilize is that the people in it be employed and able to foster that sense of stability in their families. What happened was that parents in the 1970's were the last generation to see real raises in their pay once you adjust for inflation. They struggled with their children because they couldn't afford to engage them in meaningful pursuits in the same way prior middle class parents did and many suburban middle class families are able to. Mix that in with a consumer based society, add a touch or two of resentment and the oppression of racial bias, which is America and here we are. It's also worth noting that Chicago's crime is not only a result of poverty, and racial residential segregation also plays a significant part. For example, the crime rate in many middle-class black neighborhoods such as Calumet Heights is about the same as it is in low-income Latino neighborhoods such as Little Village. And even if you control for race and income, crime varies a lot by neighborhood depending on segregation. For example, the median household income in Englewood is about $20,000, and the murder rate over the past few years has been about 70/100k. Uptown is about 20% black and the median household income for blacks is about $18,000. Based on demographics, you would expect the murder rate to be at least 14/100k, but it's actually about 5/100k. If you look at this article http://danielkayhertz.com/2013/08/05/weve-talked-about-homicide-in-chicago-at-least-one-million-times-but-i-dont-think-this-has-come-up/, you can see that integrated neighborhoods like Uptown used to have much higher crime rates. However, over the past 20 years, the crime rates in integrated neighborhoods have fallen dramatically while the crime rates in segregated neighborhoods have not. My suspicion, based on anecdotal evidence, is that there is another facet of police discrimination. In addition to harassing black youths without probable cause for suspicion, I've heard instances of the police not being responsive when real crimes are committed. I think that better policing strategies could actually make a difference in reducing Chicago's crime rate, but that would involve building better relations between the police and community members instead of bringing in the National Guard. Sadly the excuse of 'racism' or 'racial inequality' continues to promote the very behaviors it "says" it is trying to cure. Blacks are slaves... AGAIN. They've allowed the 'entitlement' based government to enslave them thru the "Great society" (where this all began) and all the other freebies so often (now!) screamed for... 48% of black families are on food stamps, not because their color is 'black' but because 70% of black families are fatherless, on the average only 60% of black male teens graduate from high school (average), abortion in the black community is staggering and out of wedlock births are at 70% and rising. Slaves once again and at the hands of Sharpton, Jackson and Obama. The only thing missing are the chains but there can be no doubt the blacks are chained to ignorance, violence, and a perpetual 'blame whitey' mentality. Get off the 'pipe' of welfare and entitlements and do what MLK suggested, "get an education", "be a responsible father and raise your kids" and stop killing each other. Otherwise in another 100 years you will have finally eliminated slavery by exterminating yourselves! I must have totally missed the sarcastic intent of the author. Surely he knows that President of the United States- the most powerful man in the world is a black male from Chicago. The same black male that was their congressman before his coronation as President. This black man must have Houdini like powers. From the author's viewpoint, nothing short of a miracle could have resulted in this outcome for such a hopeless creature as a poor black male. What about Ben Carson? Another miracle your conclusions would suggest. How dare you disgrace the millions of successful blacks that have "overcome" the destiny of failure you would lock them into. Perhaps what is needed is NOT more "handouts and programs". Why not ask the most successful black man of all time, a black male from Chicago, how he did it. Or ask Ben Carson, or my next door neighbor who came to this country from Trinidad with no education and barely able to speak the language. I bet none of them even think of smaller class sizes, free food or more handouts like you demand. Where has that worked? Nowhere! list the same things that make any person successful. Hard work, self respect, personal responsibility, perseverance, sacrifice, and did I mention- HARD WORK. So why don't people like Carson and Obama or any other successful black male suggest this? Oh yeah, one did, repeatedly. Bill Cosby. It took a while, but your kind skewed him. The truth may hurt, but it is the truth. The garbage you are spewing is killing thousands and ruining the lives of millions every year. Maybe with more programs you could kill more. I truly believe that is what you are trying to do. Too bad the handouts your kind has given out for the last half century are blindfolding your victims as you lead them to their own destruction. And anyone that protests is labeled a racists. You are the racist. You have taken away these people's dignity and motivation. You have convinced them that more handouts and further blame of white people for their dilemma is their only chance. It is sickening to see. If you do not believe me, look at the facts. Hundreds of young black males die EACH WEEKEND at their own hands. Not a peep from anyone. I guess those Black Lives do not matter. You have trained them that way. One dies after attacking a police officer after just completing a strong arm robbery, and the city riots. More will die. On and on and your kind cheers them on. Nothing changes, hatred grows, despair grows and your kind lines their pockets. You might even go to sleep in your nice house feeling like your are really doing some good. The results are in. It does not work. It is total lunacy. Every person in America knows who Martin Luther King is. He is the Messiah of "African Americans". Why not tell the ones that hold him in such high esteem, what Dr. King really preached. His dream. Judge one on the content of his character, not the color of his skin. Only racists dare mention such heresy today.